Along with the usual set of twelve shimmer and creme shades, OPI is releasing three new colors of Liquid Sand. Two cremes and one mind-blowingly pretty glitter! OPI Liquid Sand polish in Alcatraz Rocks. Whoa. Look at this masterpiece of a polish. 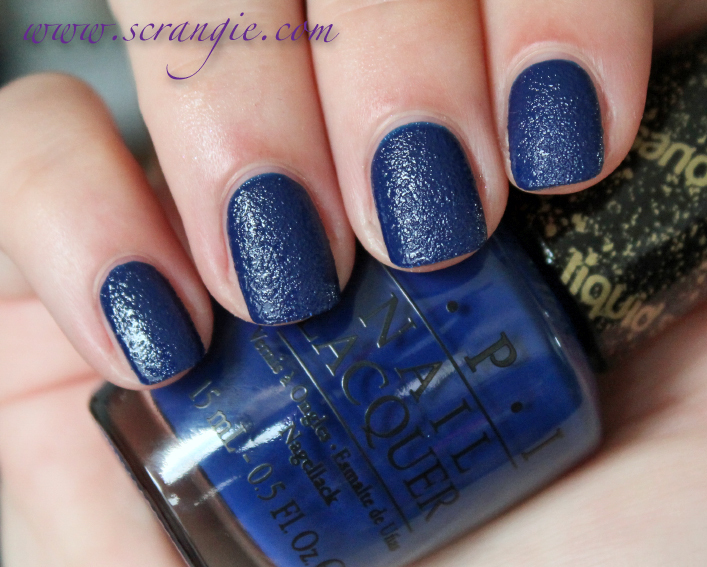 It's a deep blue base with the typical Liquid Sand/textured polish grit, but it also has tons of multicolor glitter. I think I see every color of the rainbow in here. It looks fantastic as-is, but if you don't mind doing two or three coats of topcoat, you can turn it into a glossy glitter polish with a smooth finish instead. OPI Liquid Sand Polish in It's All San Andreas's Fault. This one is a creme-finish medium taupe brown. Dries a shade or two darker than bottle color. Never becomes fully matte after it dries so it has a tiny bit of gloss to it. OPI Liquid Sand Polish in Wharf! Wharf! Wharf! Gorgeous, rich blue creme base with textured grit. Also dries a bit darker than bottle color. And the name... I know it's supposed to be woof, woof, like a dog, except wharf because it's by the ocean, but all I can think is... Wharf! Wharf! The formula on these is a dream. Perfect thin texture. Absolutely nothing to even criticize as far as the application is concerned. One tip for applying, though: Do thin, even coats. If the polish base is too thick in some areas, it'll gloss out your sandy texture. Dry time on these is fast. They do chip faster than a normal polish, but not as fast as a true matte. If you're only going to get one textured polish this year, seriously consider Alcatraz Rocks. It's AWESOME. The other two are cool, but seem unimpressive next to Alcatraz Rocks. It's a scene-stealer for sure. Wharf, Wharf, Wharf is probably supposed to actually be like the seals and sea lions there. 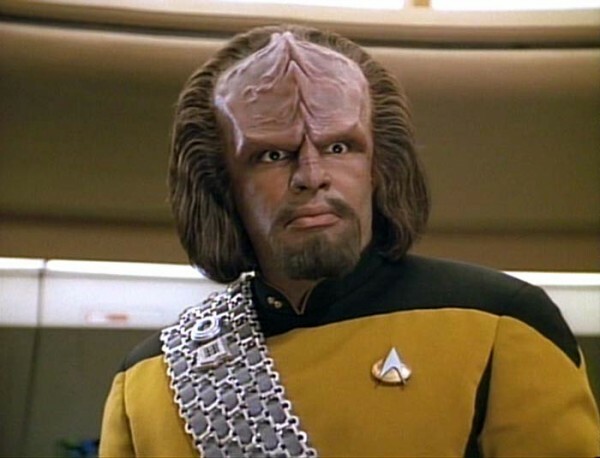 It always makes me think of Worf too though. XD These all look pretty awesome. Are you going to be reviewing the cremes too? Are you going to be reviewing the cremes from this line as well? 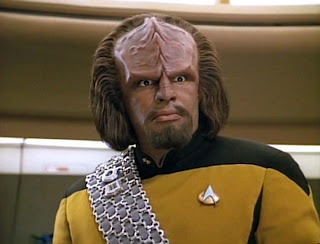 LMAO at Worf!! Alcatraz Rocks looks to be the most interesting of these 3 is to say the least! It looks to be the best liquid sand I've seen yet. I can't wait to see it in person. While I agree these chip faster than regular polishes, they are extremely easy to touch up invisibly! Alcatraz Rocks is pretty, reminds me of jeans/denim in a way. I really like Alcatraz Rocks! Alcatraz Rocks is just stunning! Alcatraz Rocks is probably the only polish I want from this collection. I saw these colors at my nail salon this week, they are all gorgeous. Which one to get?? the amount that I want Alcatraz Rocks, is not healthy! It's All San Andrea's Fault is gorgeous! Alcatraz is gorgeous! It's proof on why not to judge an OPI by its press release photos. Alcatraz Rocks looks a lot like P2 Confidential. Dupe alarm, maybe? I wonder how different they are. It's 1,95€ vs 16€, after all. I've been waiting weeks for someone to make the Worf joke, and Scrangie did not disappoint! Would love to see OPI come out with a hot pink or fuschia color in liquid sand. Have the red, light pink and the dark taupe---love the stuff. Stays on really well! Would love to see OPI come out with a hot pink or fushia in the liquid gold. Have several of the colors and it is awesome. Stays one great!! !